Bangalore, the garden city is the cosmopolitan and capital city of Karnataka. The Magadi Chieftain, Kempe Gowda, laid the foundation of Bangalore in 1537. According to local people, the word "Bangalore" is derived from ‘Bendakalooru’ or the town of boiled beans. Bangalore is the fifth largest city in India and the fastest growing city of Asia. 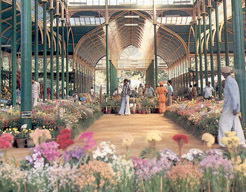 Bangalore is also known as the garden city due to various gardens which are found here. It is also known as the computer city and the Silicon valley of the east. This city attracts tourists from all over the world. Bangalore is a major industrial and commercial centre, well known for its scientific and research institutions. Its growing software industry has given it the reputation of being the ‘Silicon Valley’ of India. Various top most industries have been also established in Bangalore like HAL, the Indian Telephone Industry, Infosys, etc. The climate of Bangalore is mild and healthy which is neither too hot nor too cold. so, Bangalore can be visited throughout the year. According to local people, the word "Bangalore" is derived from ‘Bendakalooru’ or the town of boiled beans. This name was given by Veera Ballala, a king of the Vijayanagar dynasty. The king lost his way in the forest and as he travelled slowly through the tall trees and thick brush he spotted a little hut. He knocked hopefully and the door was opened by an old woman, who welcomed the Prince into her home and offered him some ‘Bendakalu’, boiled beans which he ate hungrily. He asked her the name of the place, which the gracious lady misunderstood and said, ‘Bendakalu’, which means the boiled beans. The prince later decided to name the place which gave him refreshment as ‘Benda kala uru’, and thus, Bangalore got its name. Bangalore was also ruled by the several Maharajas of Mysore. The major tourist attractions in Bangalore are the Bull Temple, Vidhan Saudha, Lal bagh and the Tipu Sultan's Palace. The bull temple was constructed in the 16th century AD. The main attraction of the temple is the sacred huge monolithic Nandi bull after which the temple has been named. The Vidhan Saudha is a four storeyed building which was built after the India's independence. Lal bagh is a botanical garden, which is spread over 240 acres of land. This beautiful garden was laid by Hyder Ali in 1760 and later developed by Tipu Sultan. This garden was originally known as Lal bagh because the garden had a profusion of red roses. This garden houses over 1,800 species of rare herbs, plants and centuries-old trees. The garden is known for its exotic trees, lakes, lotus ponds, lawns and rare plants brought from abroad. A green house is also placed in the middle of the garden which has a collection of various kinds of flora. The Glass House is built on the lines of the Crystal Palace in London and is the main attraction of this huge park and also the venue of the colourful Flower Show. The Vidhan Saudha is a four storeyed building which was built after the India's independence. This magnificent building was conceived and executed by Chief Minister Kengal Hanumanthaiya in 1956. The Vidhan Saudha houses the State Legislative Assembly and part of the secretariat. This building is the combination of ancient and modern style of architecture and built in the neo-Dravidian style out of the Bangalore granite. The building is illuminated on Sunday evenings, weekends and public holidays. The Tipu Sultan's palace is built out of the teakwood. This palace was built between 1781-1791. The major attraction of the palace are the floral designs on the walls and ceilings. After Tipu’s death the palace was used as a Secretariat by the British until 1867.
was originally constructed by Kempe Gowda out of the mud and brick. Later, Hyder Ali, rebuilt this fort out of stone. Though most of the fort was destroyed during the war and now only ruins remains. Now the crumbling walls of the fort form a backdrop in the city market of Bangalore. Tipu's summer Palace, one of the Tipu’s summer retreat was laid by Hyder Ali and later on completed by Tipu Sultan. It is an elegant two storey wooden structure with ornate pillars, balconies, arches and a well maintained garden. Tipu Sultan’s summer palace now houses the collection of the old things of his times. Bannerghatta National park is located about 22 kms. from Bangalore. This national park is spread over an area of 104 square kms and set in picturesque surroundings. This national park is a lion and tiger reserve and also houses a crocodile and snake farm. It was designed by Lt. Gen. Mark Cubbon, in 1864. the park covers an area of over 300 acres in the heart of the city and is the green zone of Bangalore. The park is also studded with some splendid sculptures and red Gothic Buildings, which house the Public Library, the High Court, the Government Museum and the Technological & Industrial Museum. The Children’s Park inside the garden is exclusively for kids, adults are allowed entry only if accompanied by children. The Jawaharlal Bal Bhavan here has a children’s centre, which screens children films and also conducts courses in pottery, aero-modelling etc. The Government Museum established in 1886, is on of the oldest of India. It exhibits a unique collection of sculptures, inscriptions, paintings, coins, geology and relics from Mohanjodaro, Halebidu and Vijayanagar. The art Gallery has paintings and sculptures done by K. Venkatappa, a renowned artist from the royal court of Mysore. The magnificent two storeyed building of Attara Kacheri, literally the ‘Eighteen Courts’, houses the High Court of Karnataka and several lower courts. It lies just in front of the Vidhan Soudha and was built in 1867, to house the Secretariat. The beautiful Hare Krishna shrine on the hillock attracts a large number of devotees. The fusion of modern technology and spiritual harmony makes it a worth visiting site. Panoramic view of the surroundings can be enjoyed from here. 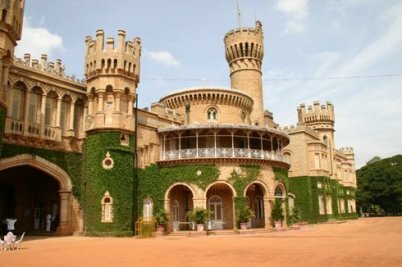 The magnificent palace built in 1887, by the Wodeyar’s of Mysore resembles the famous Windsor Castle in England. The Beautiful granite palace is noted for its exquisite wood carvings. It displays a wide range of folk arts, costumes, toys and extensive recorded music collection. This interesting museum is dedicated to Sir M. Visweswaraiah, the architect of modern Karnataka. It exhibits applications of science and technology to the industry and human welfare. The modern planetarium built in 1989, provides an insight into the world of astronomy, through interesting shows at sky theatre. An attractive Musical Fountain with dancing waters is set opposite the planetarium. Ramohalli is the popular picnic spot located about 28 kms. via Mysore road and Kangeri. The main attraction of this park is the 400 years old huge banyan tree. The branches of the huge banyan tree spreads over an area of almost 3 acres. It is one of the oldest temples of Bangalore. There is a huge monolithic statue of Lord Ganapathi, which attracts a large number of devotees. The temple dedicated to Lord Shiva was built by Kempe Gowda. A large number of devotees gather here on ‘Makar Sankranti’ (14th Jan.), to witness a unique phenomenon, when the rays of sun passes through an arch between the horns of the sculpture of Nandi bull outside the temple and illuminates the idol of Lord Gavi Gangadareshwara inside the main shrine. It enshrines fine images of Lord Krishna and Sri Dharamaraja Swami, the hero of epic Mahabharata. The sacred shrine is also associated with the famous Karaga festival celebrated in March / April. Karaga, an earthen pot covered with flowers is a symbol of draupadi. It is carried on the head by a priest dressed like a woman and is followed by sword brandishing devotees known as Veerakumars on a moonlit night. It is interesting to note that the Hindu procession also visits the dargah of Sufi saint Thavakkal Mastan. It was built by Kempegowda and is the oldest temple of Bangalore. The temple situated on the Bugle Hill is built in Dravidian style, measures 4.57 metres in height and 6.10 metres in length. It was originally built in 1818, by Abbe Dubois, a French missionary. In 1882, this small chapel was transformed into a huge Gothic style church with beautiful glass stained windows by Rev. Kleiner. The church was given the statues of a basilica in 1973, through a papal order by Pope John Paul IV. Bangalore is a shopper’s paradise. Brass and copper temple carvings and figures, woodcraft (sandalwood and rosewood), stone carvings and stone friezes in granite and soapstone, perfumes, incense sticks, sandalwood oil and soaps, laquerware, clayware, ceramics, carpets, durries, fabrics and saris, Mysore silk, silk saris, silverware, jewellery, brass and ivory artifacts and Lambani jewellery are the various items that can be bought from Bangalore. For silk saris and cloth, the Karnataka Silk Industries Corporation runs show rooms at the Mahatma Gandhi Road and the Kempe Gowda Road. The main shopping areas of the city are the Kempe Gowda Road, Mahatma Gandhi Road, Jayachamarajendra Road, Jayanagar Shopping Complex, Russel Market and Commercial Street. Bangalore is the city of Shopping Malls that cover various large Shopping Complexes. It is famous for the ashram of world renowned saint philosopher Sri Satya Sai baba. At Whitefield is the international Tech Park, one of he most modern and successful software tecnh parks of the country. This major export oriented software centre has contributed immensely in making the ‘IT Capital’ or the ‘Silicon Valley of India’. The beautiful lake set amidst lush fertile landscape is famous for for its boating and wind surfing facilities. The region teems with orchards, poultry and sheep farms. An indo-Danish dairy project has also has beenestablished here. The beautiful hill resort sprawling over three thickly – wooded hills is famous for Namada Chilume, a natural water spring. It said that the spring was created by Lord Rama, by pressing the rock surface with his big toe. Namada Chilume Sanctuary, lies about 10 kms. From Devarayanadurg amidst thickly forested landscape. The charming little hill resort is endowed with breathing beauty and salubrious climate. It was the summer resort of Tipu Sultan, who further strengthened the existing fortification on the hills in 18th century. Later on, it became a favorites resort of the the British. Nandi Hills is also known for its two ancient temples dedicated to Lord Shiva and the shimmering Amrita Sarovar Lake amidst sylvan surroundings. This unique experimental village is dedicated to the gurukula tradition of learning to revive the Indian classical dance and music. Courses on Indian classical dance, music, choreography and paintings are held here. The village is also a winner of rural architecture award. Vasantha Habba, the annual festival celebrated here attracts a large number of visitors. The scenic site is named after the small pool created by the waterfalls, which looks like a ‘pond of pearl’. There is also a small temple over here. Bangalore is the main international airport in Karnataka. Indian Airlines and Private airlines daily operates flight between Bangalore and other cities of India. Bangalore has direct rail connections to Chennai, Mumbai, Delhi, Ahmedabad, Trichy, Thiruvananthapuram and all the other places. Bangalore has very good roads that connect all parts of the South India and Bombay. It is well connected to Mysore, Ooty, Chennai and Hampi. To know the distances from Bangalore click here.